Jolokia is an agent based approach for remote JMX access. It is an alternative to standard JSR 160 connectors. The communication between client and agent goes over HTTP (either GET or POST), where the request and response payload is represented in JSON. Up to now JMX notifications are not supported yet (but these are on the roadmap for a future version). Jolokia's overall architecture is shown in the next diagram. The agent translates between JSON over HTTP and calls to local MBeans, including a JSON serialization of the return values. Fine grained security with access restriction on MBean operation and attribute level. Merging of multiple MBeanServer into one virtual view, so there's no need to know in advance which MBean is registered on which MBeanServer. With JSR-160 the target MBeanServer has to be known in advance. History mode for storing previous fetched values in a cache on the server side, along with a time stamp. This is especially useful to calculate the change of JMX attributes without need of a client storage. No Java is required on the client side due to the platform neutral nature of HTTP and JSON. JSON serialization allows for deep access into returned objects without having custom type definitions installed on the client side. Since HTTP uses a single predefined port, this setup plays nicely with firewall configuration. The JSR-160 default connector in contrast is not that smart since RMI uses a random port for its communication by default. As paradox as it might sound, setting up an agent is often easier than setting up the configuration for JSR-160 JMX export, especially when it comes to security. Typically, for JSR-160 export startup files and configuration of the application server has to be adapted. The standard agent gets deployed as a regular web-application, which is a well known procedure. The single disadvantage of this mode is, that an agent has to be installed. This might be for policy reasons that no external application is allowed to be installed. Or all servers to be monitored are already prepared for JSR-160 JMX export so an extra installation step is not welcome. Also, updating Jolokia normally implies a redeployment of the agent. These are all good reasons, for which Jolokia has an answer, too. By installing a dedicated Java EE-Server with an deployed agent, Jolokia can operate in proxy mode, in which case it translate Jolokia JSON request into JSR-160 client request for operation on the target server. Vice versa, the result over a JSR-160 connector then gets translated into a JSON response which is returned to Jolokia client. Learn something about bulk JMX requests. 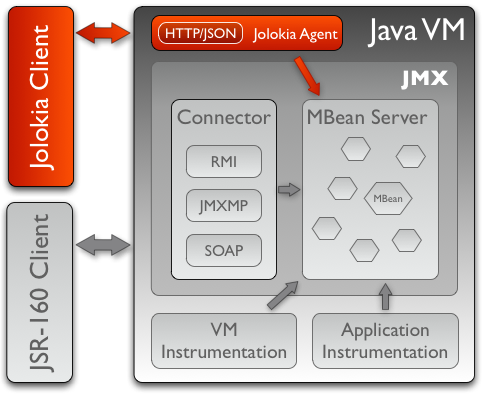 See why jolokia is the perfect choice for non-Java environments to access Java servers via JMX.